The IEC Low-Profile, Poly Base Metric Swivel Stud leveler in steel and stainless steel is ideal for medium-duty load requirements. 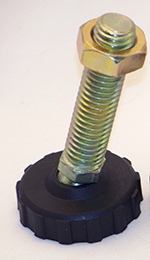 Nylon bases from 1” to 4” with 15 degree swivel from centerline. Steel Stud has trivalent zinc, yellow chromate finish.